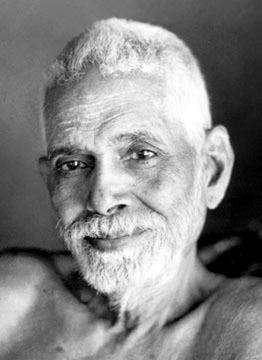 Ramana had His own way of eradicating the ego, whenever it showed up in his disciples. Muruganar, one of the greatest devotees of Bhagavan Ramana, a remarkable poet, had an urge to pen something akin to Siva Puranam (a great work on Lord Siva by the great saint Manickavasagar) about Ramana. Devotion took the shape of words as it poured down on paper. Muruganar was however doubtful if he should call it ‘Siva Puranam’ owing to his firm belief that Ramana was none other than Shiva, or ‘Ramana Puram’. Unable to discern the same he left it for Bhagavan to decide. Bhagavan graciously wrote ‘Ramana Puranam’ in each page and also Himself being a poet par excellence, added a few more verses. The work was completed and was presented to Bhagavan for proof reading, Bhagavan found at the beginning of the verses that He had penned, “Written by Bhagavan” added by Muruganar. Picture shows indian mystic Ramana Maharshi, 1879-1950. It was taken by G. G. Welling around 1940. Copyright-holder is Sri Ramanasramam, Tiruvannamalai, 606603, Tamil Nadu, India: "The copyright holder gives permission to any visitor to wikipedia to download the photographs." The Master said, “Oh from here Bhagavan has written?” The open question was simply a bash to the ego. Was not the whole poem an outcome of His Grace? Was He not the sole poet? That one simple question cut asunder the sense of doer-ship, stemming out of the sense of an individual identity, the ‘I’, the ego. He is the only reality that shines as the self in all manifestations. When one is focused on multiplicity owing to focusing on outward manifestations, separate identity blinds the truth of the one underlying, unifying essence in all manifestations, the Self. In a conversation with a devotee of Bhagavan regarding this episode, she recalled an incident where another devotee strongly objected to his name being published for his writings. If the objection was to avoid the possible swelling of the ego, it is also a subtle but sure instance of the existence of the ego in another form, harbouring the sense of ownership to one’s name. Even with regards to me, when I was impelled to write this blog, the fear of the ego getting boosted was inevitable. However it took some time to realise before taking to writing, that He is the sole doer and the seeming individual actions are all but His. Are not all movements that of the Cosmic Dancer’s? It is a simple revelation that the life of the Master is as important as His teachings, for His life itself is a great teaching. It is a treasure trove were gems of practical wisdom sparkles to light up the path of spiritual seeking.